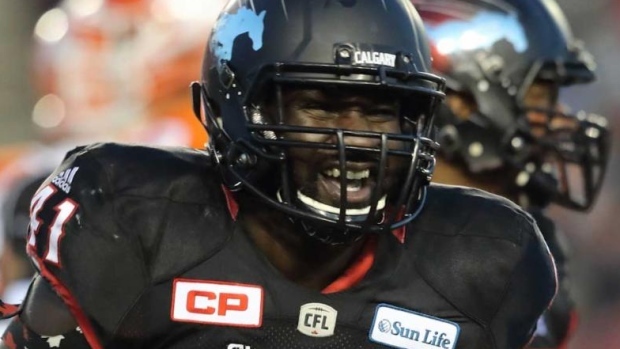 CALGARY — The Calgary Stampeders have signed international defensive lineman Cordarro Law. After two seasons with the NFL's San Diego Chargers, Law rejoined the Stamps in September and he recorded three sacks, one fumble recovery and nine tackles in four regular-season games. The 28-year-old Whitfield, Ala., native had two tackles in the Western Final and one tackle and one knockdown in Calgary's Grey Cup loss to Ottawa. Law previously played for the Stampeders in 2012 and 2013 and accumulated 15 sacks in 18 regular-season games over that period. The three-year CFL veteran was eligible to become a free agent in February. "I'm excited to be back and I'm looking forward to making another run at the Grey Cup," Law said in a statement. "I've loved this city from the first time that I played here and I was glad to get a chance to rejoin the team this past season. Calgary is my second home and I want to play here for a long time."